Rattan is one of the oldest industries in Hong Kong and astute merchants and skilled craftsmen in southern China had long profited from importing rattan cane from Southeast Asia (the majority from Indonesia with the remainder from Malaysia, Burma and the Philippines), weaving them into beautiful products such as baskets, furniture, hats, mats etc. and selling them at home and overseas. Similar to how the wood carvers from Dongyang in Zhejiang province have dominated the wooden furniture industry or the Heshan natives in Guangdong province the HK printing industry, Hakka craftsmen from Hingning (pinyin: Xingning), the second largest city in eastern Guangdong province within the Meizhou prefecture came to dominate the HK rattan industry. In fact the industry’s leading trade group – the Hong Kong & Kowloon Wing Hing Tong Rattan Ware Merchants Association (港九永興堂籐器同業商會, referred to as “Wing Hing Tong” hereafter) – was founded in 1870 and continued to be dominated by Hakka rattan merchants, with Wing Hing meaning “forever Hingning”. 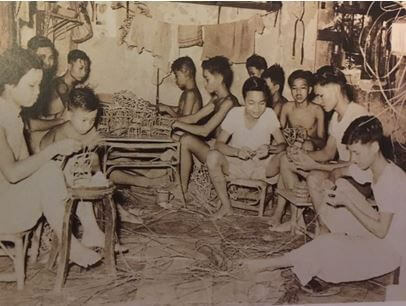 At its peak in the 1950s and 60s, the rattan industry employed over 50-60,000 workers in Hong Kong and included hundreds of players (many of them family workshops with about two dozen of significant size some of which are profiled below). A US consulate report in 1955 stated that the number one export item to the US from HK by value and volume was rattan furniture followed by rattan basket ware. Matthew Turner regarded rattan as one of the first HK industries to be “Americanized” – helped by the non-Chinese origins of the materials involved (a requirement of the US embargo), the dexterity required in production, the family connections behind subcontracting and distribution, and the extraordinary proliferation of designs. Over time as skilled workers retired, production moved north and other industries emerged, hence the industry lost its relative importance in HK. 1952: Export cargo carryings to the U.S.A. have dwindled to a small fraction of those of previous years, and in 1952 rattan furniture was the only commodity which moved in any quantity. 1956: The recorded value of shipments of rattan furniture in 1956 showed a further 10 per cent increase on the previous year’s figures. Some of this increase, which is noticeable in respect of shipments to the U.S.A. and Canada, will undoubtedly be accounted for by the continued trend away from the traditional tub chair to the higher quality shell variety which, although somewhat more expensive, is enjoying a great contemporary vogue. Quality of products has been well maintained and, particularly in the tub chairs has become much more dependable so that there have been very few complaints. Prices fluctuated within fairly narrow margins in the early part of the year but, later on, they were forced upward by shortage and irregularity of supplies of cane as a result of political disturbances m Indonesia. The immediate future of the industry is somewhat clouded by several different disturbing factors. The situation in Indonesia, whence are drawn the majority of raw materials, has, as already stated, driven costs upwards. On top of this the Shipping Conference has instituted a revised system of bale measurement which will certainly increase the freight part of C.I.F. costs and there is, in any case, a scheduled increase in freight rates and in railroad freight rates within the U.S.A. Opinion is divided as to whether the combination of all these will result in the Hong Kong product being found uncompetitive or whether the higher prices will be acceptable after the market has had time to get used to them. In any case, it seems probable that the U.S., which absorbs the great majority (82 per cent in 1956) of the Colony’s shipments, will take some time to adjust its views on this matter and will, almost certainly, not be in the market again until present stocks have reached a very low level. 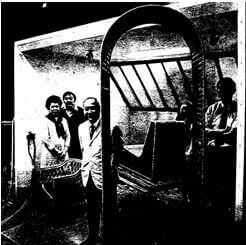 1963: The furniture section of the rattan industry, after suffering a decline for the past few years, took a small, but welcomed upward swing during 1962. In spite of its many advantages, plastic coated rattan is far less in demand than natural rattan, except m Australia, which takes about equal quantities of both types. The United States continue to be Hong Kong’s best customers, absorbing 60% of the Colony’s exports of plain rattan furniture. Cyprus, which in 1961 only bought $60 000 worth of plastic coated rattan furniture, last year took $187 000 worth. It would seem that, in view of the Island’s comparatively small population, most of this furniture must be for re-export to neighboring Mediterranean countries. The cost of raw materials has risen somewhat, particularly 18/ 24mm rattan cane, used for smaller sized shell chairs, which rocketed by 30% to 40%. First quality cane for Malacca furniture was in short supply and prices accordingly rose 10% to 15%. 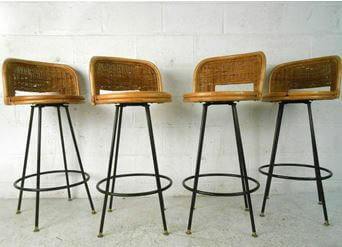 Cane used for shell chair frames showed little fluctuation; as did rattan peel. The drop in demand for rattan furniture in the earlier part of the year had brought with it a lowering of wages by 5% to 10%. The class of workers to have successfully resisted this tendency were the tub chair makers, whose wages had in fact risen by about 50%. This unusual state of affairs was brought about by a depletion in their ranks following a shift of demand from tub chair to shell chair. The labour force in the rattan furniture industry decreased significantly, many workers finding it more profitable to join the ranks of rattanware makers. One of the main reasons for the falling off in sales in the U .S.A. market in recent years has been the deterioration of quality brought about by excessive competition. This new season was seen an improvement in quality in so far as the U.S. market Is concerned. This is apparently due to the smaller demand in this market, resulting in less competition and better quality. However, this cannot be said of plastic-coated shell chair shipments to U.K. Because of the excessive competition that is still very much in evidence for this market, quality, as usual, has suffered, to the detriment of the industry as a whole. In the rattanware section, last season saw a marked increase in sales of handbags of 40% to 50% over the preceding period. Other 54 items, such as baskets, were down by approximately 20%. The overall picture, however, is encouraging with a rise in value of exports amounting. to some $5 million, entirely accounted for by increased sales to the United States. 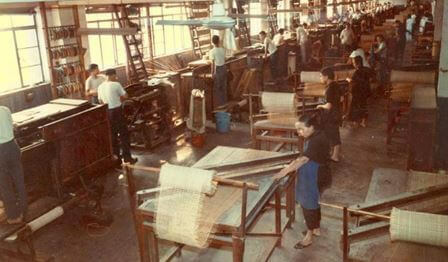 Established in 1885, Hang Cheung Shing was one of the oldest and largest firms in the rattan industry. 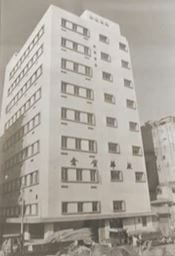 For decades, the firm operated out of 43 Queen’s Road Central, which was re-developed into the office building Lansing House (聯成大廈) in 1969. Its proprietor Loong Sui-chor (龍瑞初), who resided at 30A Stanley Street, served as chairman of Wing Hing Tong during the 1930s and raised money for war relief effort during the Sino-Japanese War. Part of Loong’s success was his tight relationships with importers in the West, particularly the United States. In 1921, Loong jointly registered the trademark “Miloo” for rattan products with William M. Milne, an importer in San Francisco (Miloo likely an acronym of the last names Milne and Loong). 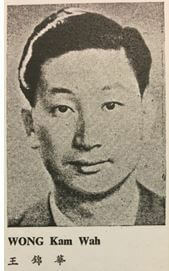 Sui-chor’s son Loong Ping-tong (龍炳棠, aka PT Loong) took over the helm. Born in 1916, P.T. graduated from St Joseph’s College and was a very active community leader in the 1950s and 1960s, having served as chairman of the Tung Wah Group of Hospitals (1956) and the Chinese Amateur Athletic Federation of HK. In addition to running Hang Cheung Shing. PT was also head of P.T. Loong & Co (exporter of rattan and Chinese products) and general manager of HK Rattan Manufacturing Co, which was a pioneer of machine made rattan core, cane webbing and split rattan with a factory located at 188-192 Hai Tan Street (海壇街) in Sham Shui Po. Throughout its history, Hang Cheung Shing largely stayed out of the limelight except for June 1951, when it laid off 24 workers which triggered a series of coverage from the left-wing paper Ta Kung Pao. Through Kwong Tai Cheong and Nathan Rattan, the Tsang family has played a crucial role in the HK rattan industry for over one and a quarter century. The story began with Tsang Hang-tong (曾杏棠), who co-founded the Wing Hing Tong Association with Lau Kang-ting and started Kwong Tai Cheong in 1892. Located at 16 D’Aguilar Street, Kwong Tai Cheong was allegedly the first rattan retail outlet in Central. Under the leadership of Hang-tong’s fourth son Tsang Yiu-sing (曾耀星), the business soared to new heights. A graduate of King’s College, Yiu-sing traveled extensively in Europe and the US for business. 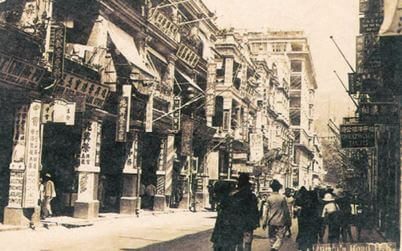 In 1926, Nathan Rattan Furniture was founded in Kowloon, named after Nathan Road where it was located. (23 Nathan Road). In the 1959 Harper’s Bazaar, it declared that “the entrancingly curlicued rattan furniture made here (Hong Kong) is the best in the world” and listed Nathan Rattan and its address. By the 1960s, business was booming thanks to the influx of tourists and a second store was added at 28 Mody Road and a third store was added at 60 Granville Road. In 1974, a manufacturing subsidiary by the name of Nathan International Limited was formed and the firm developed a successful business furnishing hotels and resorts. in 2009, NathanDirect.com was formed to bring rattan products to the US via an online portal. The business is currently managed by Winston Tsang. Chung Kong was one of the major manufacturers of rattan furniture and basket ware and operated out of Fook Wing Street in Sham Shui Po, Kowloon. The firm’s founder Yuen Ng-chung (袁五松, 1885-1967) was an influential leader in the Hakka community, having served as chairman of Tsung Tsin Association, Association of Natives of Hing Ning Resident in Hong Kong, Kaying Natives Association (旅港嘉應五屬同鄉會) in addition to Wing Hing Tong. His father Yuen Shek-sau (袁石秀) was one of the prominent Hakka stone merchants in Hong Kong in the late 19th century who made their fortunes helping build reservoirs, bridges and buildings. 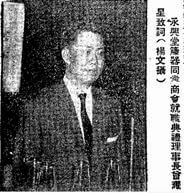 At his 81st birthday party in 1966, Yuen Ng-chung was celebrated by his fellow Hakka natives including celebrities such as historian Lo Hsiang-lin, soccer star Li Wai-tong and the KMT General Chang Fa-kui. A year later he passed away, leaving 3 sons and 8 daughters. He was succeeded in business by his son Akron Yuen See-hoe (袁仕豪). Born in HK in 1925, Akron received his bachelor degree in accounting in Kwangtung. He was a director of the Tung Wah Group of Hospitals in 1957 and chairman of the Kit Chee Sports Club and as of 2005 was still permanent honorary chairman of Wing Hing Tong. 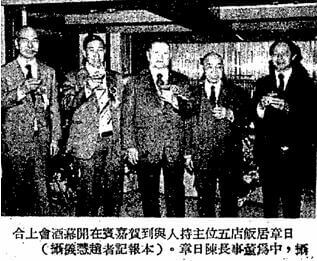 Wo Shun Company was another key player in the HK rattan industry and operated out of Haiphong Building at 101 Haiphong Road in Kowloon. The firm’s founder Wong Yum-ping (王蔭平,1894-1978) aka Wong Kwai-fook (王貴福) moved to HK from Hingning and founded Wo Shun in 1925 in Kowloon. He also established Hop Chong Company in HK island and over time became a leader in the local Hakka community and rattan industry, co-founding the Kaying Natives Association and served as chairman of groups such as Wing Hing Tong. In 1978, Yum-ping died at the age of 84 and was survived by his wife, 4 sons and 3 daughters. 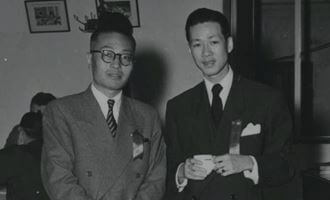 His eldest son Wong Kam Wah (王錦華) and second son Wong Chek Wah (王焯華) were both involved in the family business in Hong Kong while his third son Sun Wah (a graduate of NYU) and fourth son Yun Wah (a PhD in chemistry) both stayed in the United States. Born in 1926 in Hingning, Kam-wah studied at Chung Yuen Middle School in Hingning and Kowloon English School in HK. A number of patents related to rattan products filed in the 1960s and 1970s are attached to his name. 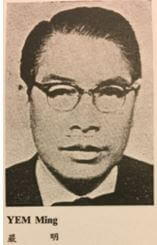 He was director of the Tung Wah Group of Hospitals back in 1959, served as vice chairman of Tsung Tsin Association and was chairman of Wing Hing Tong in the 1980s. Flying Saucer rattan chairs designed by Kowloon Rattan Ware. 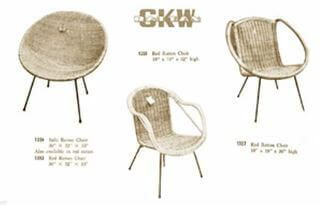 Founded in 1925, Kowloon Rattan Ware burst onto the international scene when it pioneered the design and technology of the “Flying Saucer” rattan chair in 1954 and lifted the entire HK rattan industry along with it. The firm’s founder Chan Chin-ching (陳展青) was involved in designs of some of its furniture products such as armchairs, influenced by the designs of Wakefield Rattan, the largest rattan furniture maker in America in the second half of the 19th century. Kowloon’s Flying Saucer chairs were big hits locally and in America where they were sold under the brand of the importer Walters Wicker (founded in 1939, which worked with Li & Fung) and its model 278 won an American design award in 1970. For many years, Kowloon Rattan operated out of 4 Hankow Road in Tsim Sha Tsui (building was named “Rattan House” at one point) with a factory at 1134 Canton Road in the 1960s and later in Kwai Chung. According to Who’s Who in Interior Design (2000), Roland Chan (born in 1949, presumably K.F. Chan’s son) who graduated from Woodbury University with an interior design degree in 1973 was managing director of Kowloon Rattan Ware from 1973 to 1989 when he immigrated to Vancouver. 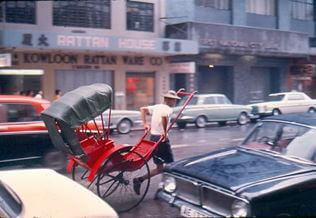 According to the company registry, Kowloon Rattan as a firm was incorporated in 1970 and dissolved in 2003. Matthew Turner, Made in Hong Kong : a history of Export Design in Hong Kong 1900-1960. Urban Council, 1988. Starting out as a small firm before the War, Man Chong Rattan emerged as a leader in the rattan industry shortly after and earned the title of “King of Rattan”. The firm’s founder Yem Ming (嚴明) had the distinction of being one of the few non-Hakka leaders of the rattan industry and multiplied his fortune by re-investing his rattan profits in property development. The second of six brothers, Yem Ming (original name Yem Ming Kee, 嚴明基) was born in 1910 and hails from Nanhai in Guangdong province. He went to Shanghai where he graduated from high school and attended Kwong Hua University before moving to Hong Kong in 1930 to seek his fortune in rattan. He first worked at Wan Cheung Machine Cut Rattan Co (允祥機器開籐公司)in Sham Shui Po here he served as assistant manager before starting Man Chong in 1933. Man Chong’s office was originally located at 40 Queen’s Road while its first factory was at 1-9 Li Po Lung Terrace in Kennedy Town. After the War, 2 additional warehouses (one on Belcher Street and the other on Catchick Street) were leased. In November 1950, the Catchick Street warehouse was damaged in a large fire and losses were substantial. Despite the setback, the growth of Man Chong continued and in 1955, Man Chong established a 5 storey, 7000 square feet rattan factory on Tree Street in Tai Kok Tsui, which was touted as the “most sophisticated rattan factory in Hong Kong”. 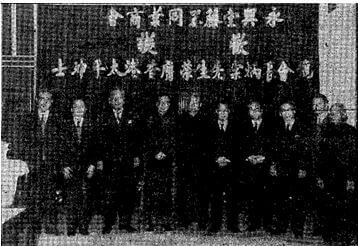 In 1958, the six Yem brothers formed Yem Bros Ltd (六基, the Chinese name means “Six Kee”, Kee being the last character of the brothers’ names) to develop real estate. One of its earliest projects was Shing Kai Mansion, a 6 story residential building on Lyttleton Road in the Mid-Levels which was built in 1963. Another project was Waiga Mansion (維基樓, the two characters represent the second and first generation of the Yem family) at 6 Hawthorn Road in Happy Valley where he resided. By the 1960s, Man Chong was operating out of 802 Central Building before moving to its own Lucky Building (六基大廈) on Wellington Street. Before his death, Yem Ming served as chairman of the Hongkong Rattan Merchants Association and Straw Mats Merchants Association. 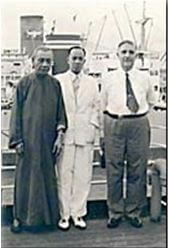 He was also a generous philanthropist and served as director of Po Leung Kuk in 1966. One of his biggest hobbies was horseracing and he and his family have been owners of racehorses for over half a century. He lived to 100 and was succeeded in business by his son William Yem (嚴維禮) and other descendants. 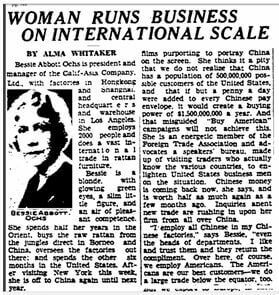 1933 Los Angeles Times article about Bessie Ochs which mentioned about her factories in Hong Kong. Chan Kai-wa (陳啟華) started in the rattan trade in the late 1930s working for a small agency that supplied to Calif-Asia, the Los Angeles-based major importer of rattan furniture founded by Bessie Abbott Ochs. The granddaughter of a China trader and a California native, Bessie studied music in Boston and fell in love with Asia during a singing tour. She married Otto Henry (“Harry”) Ochs in Shanghai in 1920 and together established Calif-Asia to assemble rattan furniture in China and ship them to the US. By the early 1930s, the business employed 2000 people in its factories in HK and Shanghai and its warehouse in LA and the Ochs spent six months per year in Asia and the other six in the US. In 1932, the HK plant of Calif-Asia was responsible for making 6000 rattan chairs for the LA Olympics, including the chair for President Herbert Hoover at the event. During the Pacific War, Calif-Asia operations were suspended and Chan’s Caucasian boss in HK was imprisoned. After the War, Chan founded Chan Kai Wa & Co in 1947 and resumed the strategic alliance with Calif-Asia, which grew bigger than ever with the post War housing boom in the US. Starting out in a small godown in Hai Tan Street in Sham Shui Po, CKW prospered in the 1950s. 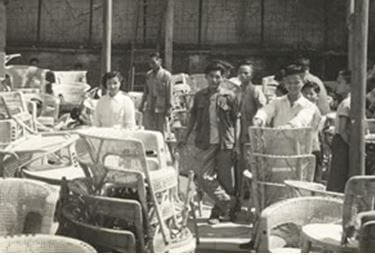 According to an article about the rattanware industry in the Far Eastern Economic Review in 1954, Chan Kai Wa Rattan was the second largest exporter of rattanware in HK handling 20% of total exports behind Li & Fung which was responsible for a third. By 1964, the firm was big enough to move into its own 8 story building on Tong Chau Street. In the 1970s, the second generation joined the business and in 1974 the firm was renamed Kai Wa Designs. CKW’s building on Tong Chau Street. After Chan Kai Wa died in 1981, he was succeeded by his widow Leung Po Wah (梁寶華) and their sons and the business expanded beyond rattan to wood, iron, bamboo and seagrass furniture. In 2003, the third generation joined the business and the firm was renamed Kai Wa Kreations. Lots has been written about the venerable trading house of Li & Fung which I will not repeat here but before the emergence of garments and plastic, rattanware was one of its main exports in the 1950s alongside other traditional Chinese products such as firecrackers, porcelain and silk and as referenced in the FEER article mentioned above, it was the largest exporter of rattanware in HK accounting for one third of total exports. It was handling 1000-2000 pieces of furniture per day and in addition to sourcing from rattan manufacturers mentioned in this article and also small scale family workshops, it also did its own manufacturing to satisfy the high volume of demand. 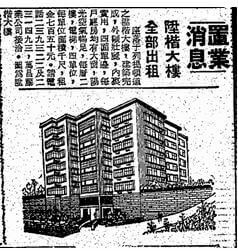 According to HK $ Directory in 1970, Li & Fung even had a dedicated rattan furniture warehouse at 45 Hoi Yuen Road in Kwun Tong. 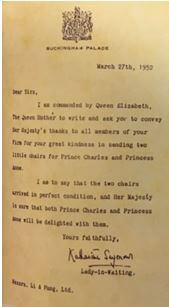 In 1952, the firm sent two rattan chairs to the Buckingham Palace for the then young Prince Charles and Princess Anne. As the chairman in the early 1950s and longtime honorary chairman of Wing Hing Tong, Chan Yat-cheung was an influential figure in the rattan industry. He presided over the controversy in 1952 which removed the flags of the new People’s Republic from the association and re-affirmed the group’s pro-KMT stand at the time. 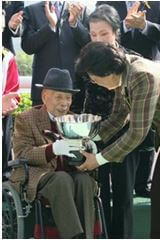 His 60th birthday in 1960 was attended by over 400 guests including many of the Hakka elites. However, little is known about his rattan firm Sam Yick Chan and his larger impact was in the restaurant industry where he was involved in establishing two of the best-known Hakka cuisine restaurants in HK in the 1940s and 50s – Tsui King Lau (醉瓊樓) and Chuen Cheung Kui (泉章居), which was named after him and his co-founder Chan Yick-chuen (陳奕泉) and continue to prosper today under the management of his nephew Chan Sek-fai. In 1979, Chan Yat-cheung opened another Hakka restaurant – Yat Cheong Kui (日章居) in Tung Choi Street in Mongkok but the restaurant was dissolved in 1991. Danny Ho Fong (centre) and family posing for LA Times with their rattan furniture. Fong Brothers succeeded in the US market in the 1950s-70s under its own Tropi-Cal brand. Although the firm is based out of Los Angeles, it did most of its manufacturing in Hong Kong and joined the HK Chamber of Commerce in 1956 with its Hong Kong office address listed as No. 128, Ngar Tsin Wai Road, 1st Floor, Kowloon. 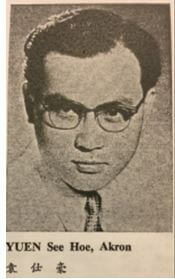 The firm’s founder Danny Ho Fong (1915-1992) came to America in 1938. With limited education but a natural talent for design, he started Tropi-Cal in 1954. He was one of the pioneers of applying modern design to rattan furniture and found success combining avant-garde design with low cost production in HK. Supported by his wife Muey Fong who was treasurer and his sons Ted and Miller and daughter Jana, by the early 1970s Fong’s firm was doing sales in the six figures (US dollars) and selling through major department stores such as Lord & Taylor. While the designs sold well in the US, they did not find a market in HK domestically where the Fongs spent a good deal of time handling the manufacturing aspects of their operations. 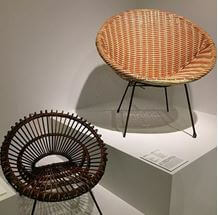 Aside from commercial success, the firm’s designs also won accolades in the artistic circles – Danny’s design of a rattan wave chaise in 1966 which was manufactured in Hong Kong made it to the permanent collection of the Museum of Modern Arts in New York and the Lotus chair designed by his son Miller (who is also an architect) in 1968 also made it to the LA County Museum of Art collection. Today, his descendants continue the furniture business under the Fong Brothers brand. “Designed in the US, Made in Hong Kong” New York Times, March 5, 1971.
he firm joined the HK General Chamber of Commerce in 1956. It listed its head office at 195, Yee Kuk Street in Sham Shui Po with its branch office at 339, Lai Chi Kok Road in the same district and factory located at Koon Tong Road in Ngau Tau Kok. Lee Luen Yick is a major supplier of rattan materials under its “Thumb” brand and is also involved in the trading of other natural products, such as bamboo, wood & metal and straw mats. Founded in 1946 by the Lee family as a small workshop processing rattan material for exporters, the firm expanded quickly during the boom years of the HK rattan industry in the 1950s and 1960s. It was incorporated in 1970 when it began exporting and was employing thousands of workers in Hong Kong, evolving over time from a purely manual to a semi mechanical process. The firm also developed its own Lee Luen Yick Building (利聯益大廈), the first character is the Chinese character for profits instead of the family surname of Lee) at 390 Lai Chi Kok Road in Sham Shui Po. In the 1980s, North American furniture makers began offshoring production and China has emerged as the center of low cost production. As a result by the early 1990s, Lee Luen Yick moved all of its production to mainland China. One of the major shareholders and directors Lee Chung (李松) passed away in 2006 and the resulting legal dispute over assets worth over HK$300 million brought the company into the spotlight. This article was first posted on 14th July 2017.